In Robert Skidelsky’s view, it is much too early to cut the deficit and the wrong comparisons are also being made. “Saying we need to cut the deficit is a false analogy between individual households and government,” he remarks. “The Government rarely needs to cut a deficit especially when the economy is in a slump. People “gear up” to thinking that this is the only possible approach but, while he disagrees with that path, there is one “justifiable” complaint: waste. “When there is concentration on the deficit, they start looking at how much government expenditure is wasteful. That is also an analogy with households. They can always do without something,” Skidelsky adds. 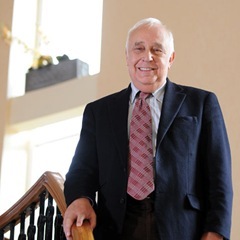 Skidelsky has just spoken at the Northern Ireland Economic Conference, and heard presentations on restructuring the regional economy and improving productivity. As capital spending in education and new technologies is needed to achieve that, the alternative is “catastrophic”. Again, he understands how this happens as there are “so many entitlements” in recurring expenditure and therefore cutting the capital budget is easier. The regulation of financial services is one area in particular where there can be no going back. Skidelsky surmises that once an economy is in a hole, there is no doubt that it is quite hard to get out. He suggests that a different kind of target is needed, perhaps to maintain a steady rate of nominal GDP growth which includes both prices and output. Government, in his view, has to be responsible for a greater share of the investment in the economy but not necessarily through public ownership. Robert Skidelsky’s three-volume biography of John Maynard Keynes (1983, 1992, 2000) has received numerous prizes and is seen as the definitive work on the economist’s life. He also lived in Keynes’ former house for 20 years. The last volume carried on to his death and looked beyond it, and came out at a time when interest was reviving. The USA was in deficit and “people were thinking about another Bretton Woods” – the world monetary conference in which Keynes was involved. Skidelsky is currently writing another Keynes-related book with his son, a philosopher, entitled ‘How much is enough?’ It will focus on Keynes’ moral outlook on economics, especially his essay ‘Economic possibilities for our grandchildren’. “So that’s another Keynes-related project. I’m never going to be shot of him,” he jokes.